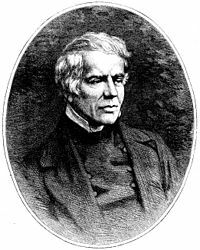 John Keble (25 April 1792 – 29 March 1866) was an English churchman and poet, one of the leaders of the Oxford Movement, and gave his name to Keble College, Oxford. Keble's early career centered in Oxford University. After compiling a brilliant undergraduate record, he became a tutor of Oriel College. Keble gained fame first as the author of what became a nineteenth-century devotional classic, The Christian Year (1827). His hymn verses, such as "Sun of My Soul, Thou Savior Dear," based on a Scripture passage from each day in the Church of England lectionary, won approval from evangelicals and other Christians. During the 1820s Keble attracted the close friendship of three younger men, John Henry Newman, Richard Hurrell Froude, and Edward Bouverie Pusey, who shared his alarm over decreasing respect for the Church. In a sermon, "National Apostasy," before the university on July 14,1833, Keble attacked doctrinal indifference and disrespect for the office of bishop. That formally began the Oxford Movement. Keble, however, lacked John Henry Newman's organizing drive. Keble largely served behind the scenes in advising and encouraging Newman and others. In 1836 opposition to the Oxford Movement kept Keble from a coveted royal professorship, so Keble spent the rest of his life in rural ministries, chiefly in the parish of Hursley. There his personal devotional life, faithful visitation, catechizing of parishioners, and attentiveness to the Church services provided a model of the Oxford Movement's principles. Throughout his life, Keble expressed dislike for the independent tendencies and principles of evangelicals. His main conflicts, though, were with the growing liberal, or Broad Church, party. Keble College at Oxford was founded as a memorial to him. John Keble's prayer book contains over 100 pieces of poetry to be used for prayer, devotions, or meditations on Sunday and holidays throughout the Christian year. It was Keble's desire that his readers would use his verses to unify their own spiritual thoughts and feelings. The Christian Year opens with morning and evening prayers, inspired by passages from Luke and Lamentations. The majority of Keble's poems correspond with a particular Sunday in the Christian year, but the book also contains a number of poems for Christian holidays and important events, such as matrimony, communion, and baptism. Keble's surpassing talent as a poet is evident on every page. The beauty of his words and the sincerity of his message are inspiring to Christians and non-Christians alike.